Dr. Anju Namashivaya is a Fetal Medicine specialist and has an experience of 10 years in this field. She has completed MBBS from Bangalore Medical College in 2001, MRCOG, DRCOG, DFFP from Royal College of Obstetrics & Gynecology. 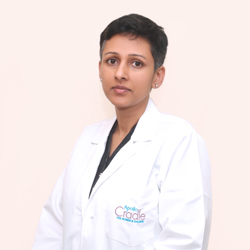 She has done Fellowship in Fetal Medicine from Bangalore Fetal Medicine Centre in 2013. She has worked as consultant with Sakra World Hospital, Rainbow Children Hospital and Bangalore Fetal Medicine Centre. She is a member of Royal College of Obstetrics & Gynecology-London, Society of Fetal Medicine-India, Fetal Medicine Foundation-UK. She is specialized in Fetal Scans, Invasive Procedures, Counselling. She can speak Hindi, Kannada, Sindhi, Tamil, English, Telugu.